Free Transit: What’s it Worth? Over the holidays, policy analyst David Gordon made an argument for assessing a county-wide payroll tax to make transit free. I don’t know enough about tax revenue to critique Mr. Gordon’s math, but the idea of replacing the regressive transit sales tax with a progressive payroll tax is certainly appealing. Free transit proposals have been bubbling up in lots of places recently. CM Mosqueda called for it a while back. The Seattle Democratic Socialists called it a “basic need” in an blurb for an upcoming candidate night. We’ve discussed it on multiple podcasts, but haven’t written much on the blog. So, should transit be free? Much like America’s health insurance system, Puget Sound transit fares are a patchwork of individually-purchased (ORCA cards & cash), employer-provided (ORCA Business Passport), and targeted subsidies (student and LIFT ORCA). Like “Medicare for All,” Mr. Gordon’s progressive payroll tax would sweep away this hodgepodge, making transit free for everyone and reducing the regressive sales tax. Passing such a tax at the ballot box would be a lift. The last time King County tried to raise funds for transit, the 2014 TBD lost 55-45. ST3 did pass in overall in 2016, but failed in Pierce County. Transit votes in this region tend to be tight, and it’s not clear that a new transit tax that didn’t include any shiny new projects would have 51% support, especially outside of Seattle (and due to the intertwined nature of our transit agencies, it really ought to be all or nothing). But let’s set politics aside for a moment. The reality of climate change, increasing income inequality, and the challenges of fare enforcement all demand that we at least consider putting an extra thumb on the scale in transit’s favor. The first response to any free transit proposal, especially if the service is already popular, usually concerns induced demand. The buses are already crowded, the argument goes, and this will make it even worse. Health care wonks voice similar concerns about universal coverage: the day President Warren signs a Medicare for All bill, it will immediately become obvious that we have a shortage of primary care physicians in America. But this in itself is a problem to be surmounted, not a showstopper, per se. “Too many people will use it” is generally a losing argument against a new public service. The second challenge is political. Today, an impressive 60% of farebox revenue already comes from Seattle-area employers in the form of ORCA Business Passport. Similar to health care, where employers already foot much of the bill, the trick will be figuring out how to gracefully redirect that firehose of money without extinguishing it. These first two problems seem difficult, but solvable. By contrast, the best argument for keeping fares is prosaic: fares bring in money. For King County Metro alone, roughly $300 million per year*. The question, then, is one of trade-offs: if $300 million were to suddenly drop out of the sky, should we use it to make transit free or to improve service? For perspective, $300 million is the equivalent of a new Center City Connector every year. Or if capital spending’s not your thing, the money could boost evening and weekend service, which is quite sparse outside of Seattle (and even in some places in Seattle). We could test the induced demand theory by offering free evenings and weekends, or during events like the Seattle Squeeze as Councilmember Sawant has suggested. Empirical evidence is welcome. In short, there’s plenty of ways for politicians interested in lowering fares to experiment with ideas and see what gets traction. * Update: I calculated $300M by taking the 15% farebox revenue from this budget. Commenter BEL points to a budget doc claiming $145M. I regret the error, but either way it’s a non-trivial sum. I’m all for income taxes (instead of regressive sales tax). BUT… we need to build out infrastructure, first. If we had a statewide sales tax, I’d first direct that cash to a statewide health system and to build an adequate transit infrastructure. Someday…….. we could reduce the sales tax. Let’s face it, what we have now provides transit to people with the cash to own a home in “ideal” locations, and the poor and middle income get stuck with homes in places currently unserved or underserved by transit. Eliminating fare would be another giveaway to the people with enough money to afford rent or a mortgage in Seattle and the close-in suburbs. Our country is last-in-the-developed-world in things like transit, healthcare and education. Right now, we simply can’t afford to cut fees or lower taxes on anyone. We’re buried in debt with an infrastructure (physical and institutional) that is increasingly fragile and inadequate. This is getting into more of a question service allocation than fares – should the focus of transit be to serve the areas where it works most effectively (because they’re dense and walkable, and have the kind of places that attract people all over the region), or whether the purpose of transit is to serve the poor for mundane trips like home->grocery store, who can’t afford other options. 50 mph car traffic; being forced to detour 3/4 mile to cross the street; 3-minute wait times for a walk signal when you finally do reach a crosswalk; apartment complexes with entrances on only one side, so everyone who lives there that wants to go somewhere on the other side has to walk (or drive) all the way around; lack of bike lanes of virtually every arterial; sidewalks that lack proper drainage and get covered with puddles every time it rains). At the end of the day, walkability and attractiveness of transit go hand in hand. [ah] You say we need another way besides regressive sales taxes, wisely state that income based taxes are more equitable, then talk about the need to raise sales taxes for health care and transit. The first step is supposed to represent the beginning of a 1000 mile journey, [lol, what? ], creating another magnificent Seattle-style policy cluster mess..
I’m concerned that lot of the marginal ridership you’d get from transit being free would come, not from cars, but from walking. Basically, people hopping on a bus for one stop that they happen to see coming, who would have just walked without the bus. The cumulative effect of this is much slower service as buses stop more often to let people on and off. Free fares for kids, I think is more beneficial, as it directly strikes at the very real problem of transit being very expensive for families – sometimes to the point where for short trips (~1 mile), the bus fares can end up costing essentially the same as Lyft/Uber. And, small children cannot be reasonably expected to walk as far as adults. And, for older children riding the bus to school, every transit trip eliminates not just one, but two car trips, since the parent that would have driven the kid to school would have also had to drive back. I used to do this exact thing on one of my old commutes in LA, and it made sense because I had a monthly pass. Because Caltrans shut down one of the sidewalks under the 405 while they were widening it, my options were basically cross the street at stoplights 3 extra times, illegally walk in the car lane on Santa Monica Blvd under the freeway and risk my life, or jump on a bus for…one stop to get to the bus route that I actually needed. Because I had a monthly pass, the marginal cost of taking that extra trip is $0, so this was a no brainer from both a cost and time perspective. Given that we already have free transfers here (LA did not at the time), a lot of other people might make that same calculation, especially in places with closed sidewalks and really lousy signal timing. Walking would drop substantially, especially in the 0.5-1.0 mile walk range (2-4 bus stops) along frequent bus corridors. In other words, the most important transit corridors would likely see surges of low-value-add ridership that would slow them down even more. Tallinn, Estonia saw this happen when it made transit free. Cost is only one factor. I’ll throw out another one – driving is far more comfortable. Nobody hits you in the face with a backpack, talks loudly on their cell phone, harasses you, etc. Those issues aren’t going to be solved by free transit – instead they could get worse if buses get more crowded. The issue is not using transfers for last-mile access; that’s a basic function of tranist. The issue is making one-stop or three-stop trips down Pine Street because you can. I do that because I have a monthly pass and I’m lazier than asdf2. The evidence from cities with free transit is that it doesn’t turn empty buses into full buses; it only increases ridership by 10% or so. Because most people don’t want to ride in circles all day for the helluva it. So if you’re worried about packed buses, they’re probably already packed and the problem is an adequate number of buses. If there’s no fare issue, the additional passengers who might otherwise walk (I have literally always had a pass, and that rarely has encouraged me not to walk the kind of distances you’re talking about, but I’ll accept your argument), the incremental waiting time will be a lot less than it is now as people fumble for change or transfers or have trouble using the ORCA reader. You’ll obviously be able to have all-door boarding. Given the city’s general hostility towards pedestrians (delete sidewalks for years during construction, sure, why not? ), there are certainly circumstances where letting someone take a bus and possibly get to an appointment or a Link or Sounder train on time instead of walking and missing it (crossed the Weller St. crosswalk recently?) wouldn’t be such a terrible thing. Different people have different thresholds for walking. Pine Street isn’t flat like Rainier Avenue, and if you live just east of the freeway you get annoyed at having to walk across that f*ing thing all the time, especially because at that point it’s two blocks of freeway hell rather than one. I walked more when I was younger but I get tired and bored more easily now. So it depends on the person’s personality, age, and physical issues; and aggregated across the population there will always be some people in both categories. I used Pine Street as a common example, but it’s the same issue at 3rd Avenue, University Way, Broadway, etc. Those are where the most pedestrians are and the most close-together destinations are, so those are where it occurs the most and would do so under free transit. On Greenwood Avenue not as much, because there’s only one 15-minute route and people are less inclined to wait for it or see if it’s coming soon. I am sure you can provide statistical evidence of exactly how much the nefarious phenomena will slow busses when, as you say, “hopping on a bus for one stop that they happen to see coming, who would have just walked without the bus. The cumulative effect of this is much slower service as buses stop more often to let people on and off.” Stating opinion as fact does no one any good. We should be talking about transportation, not just transit. The gas tax stopped covering the costs of highway infrastructure decades ago and is now draining general funds to the tune of $1+ Billion per year (just at the federal level), at the local level gas tax contributes 5%, at most, to roadway maintenance with the rest coming from general fund taxes (think about transit fare recover rates!). With continued improvements in vehicle efficiency and continued increasing demand on our roadway infrastructure the problem only gets worse. Buses and bikes need roads to travel on. As a society we need to figure out how to fund transportation either as a direct user fee (fares, tolls, mileage or time based fees) or through a general tax. Currently we have a nonsensical funding patchwork always exposed to the political whims of those in control. I would rethink transportation as a clear public utility and much like electricity or water you are charged for what you consume on a monthly basis, which could be weighted based on household income levels or business revenue. Those who want the option can have their travel patterns tracked by GPS (phone app or other tech) and provide the utility with an accurate picture of demand use. Those who do not feel comfortable with providing government that level of information can opt for a minimum monthly fee based on typical neighborhood travel patterns an the number of vehicles registered to the household. We already have vehicle emissions test sites all over urban parts of the state, which will be decommissioned in under 2 years. How about a mileage based fee that doesn’t require a GPS. A pull in and read the mileage option. It would take less time than a car that passes the emissions test. Further, the fee could be compounded by the weight of the vehicle, as heavier vehicles put exponentially more stress on pavement. Drive a massive diesel truck or SUV from Enumclaw to Shoreline every day? You’re going to pay much much more than the guy who drives a little economy car 6 miles across town. Knowing that every mile I drive costs me a certain $ amount (beyond the cost of gas) would be additional incentive not to drive or to economize and combine trips, beyond what I already do. This is even more needed as electric cars start to become more common. They pay ZERO gas tax yet produce the same wear and tear on the roads. Moving all cars over to a weight / miles traveled fee is something that needs to happen. They pay zero gas tax but they pay an extra $150 at registration, proposed to be doubled to $300, which would put it at a level comparable to what many people pay in gas tax a year. Or we could just act like an industrialized country and raise our gas taxes accordingly. > By contrast, the best argument for keeping fares is prosaic: fares bring in money. For King County Metro alone, roughly $300 million per year. This is 300 million reasons why not to make transit generally free. Particularly since we should be building policy and plans that can tolerate a recession. I would suggest looking very hard at figuring out how to redesignate WashDOT monies for giant road projects in the Tacoma-Everett corridor and aim that money at light & heavy rail. Much better bang for the buck, and avoids the fight about “raising my taxes”. Or perhaps taking out the income tax prohobition & the Eyman tax caps would also help with properly building tax policy. But cutting metro’s funding to the tune of 300 smackerooos sounds fricking mad. Yes – previous research has shown that many of the “new” trips are people who would have biked or walked, not from drivers. There is no evidence that free fares will have a big impact on drive-alone trips, which are the problem from a pollution/climate change/congestion perspective. If addressing that issue is our goal, changing the cost of driving and parking has been shown to be MUCH more effective. And guess what – that generates revenue, instead of starving transit. That translates to ~$300M. Possible this doesn’t count the Capex budget? Camel’s nose. If public transit is defined as a basic need, and therefore must be free, then other basic needs like food, housing and clothing must be free. I say no, for that reason, as well as transit being overwhelmed. What’s wrong with free food, housing, and clothing? Personally, I say we abolish the system of wage-slavery entirely. barman, expand on your idea of free housing, food and clothing for everyone. I’d honestly like to hear more about how it would work. Barman didn’t say all food, housing, and clothing must be free. He said it’s not necessarily a bad idea. You’re the one that brought it up, so it’s up to you to justify why they’re bad things. If people don’t have food, housing, and clothing, in extreme cases they die. If people don’t have transportation, they can’t fully participate and be productive in a transportation-dependent society, and in extreme cases they can’t get to the hospital or doctor’s office when they need to. The issue here is “transportation-dependent society”. If we had a land use where everything were walkable, transportation wouldn’t be as much of a necessity. So if you want to stop paying for other people’s necessities, focus on changing the city layouts so that people can work and do everyday errands using the transportation system built into their bodies: walking. No more supermarket a mile away, with a huge parking lot to walk through, and every block in between containing only three houses. God forbid that people should have food to stay alive. There should be a decent minimum standard of food, housing, and maybe clothing available to everybody, and they can get more on their own or decline the default package if they want. Transit should ideally be free too as a basic way to get around, but we can take our time to decide when and how as a society to achieve that. Jobs in the modern sense have only existed for 150 years or so. Before there were self-employed farmers and a scattering of artisans, lawyers, etc. People didn’t commute long distances to large companies they had no family/neighborhood ties to. All that came with the the industrial revolution and large factories. The large corporations and government departments were modeled after the WWII military structure. Thomas Picketty wrote about this in “Capital in the Twenty-First Century”. He focused on the changing attitudes over the 19th century. In “Pride and Prejudice” in the beginning of the century, a professional job would get you enough money for a basic life but no real financial security or inheritance for your children. But marrying into a wealthy family would get you more than you could ever earn, and enough to pass that wealth on to your children. So all jobs then were like school teachers are now. By the end of the century public attitudes had reversed, and jobs were seen as more attractive and expected. Still, the head start of inherited assets accumulated greater wealth than a job could provide. But after the triple calamity of WWI, the Depression, and WWII, many old fortunes were obliterated, people got used to social equality in the infantry units, and they were seeking a New Deal to prevent the Depression from returning. So many family fortunes were obliterated, their class privileges were no longer respected, and emerging technologies and management styles gave more opportunities to work yourself to wealth. This was followed by the “meritocracy” argument, that people like Bill Gates succeeded because they were good at what they did and made it all themselves without subsidies. But in fact their parents had the means to send them to good schools where they could meet good contacts, and society funded the public schools that gave everybody else a baseline of skills. So we need to stop thinking of jobs as a structural necessity for the economy or a moral necessity for personal virtues, and instead as just one structural alternative that we may or may not want to continue in the future. An alternative would be a Nordic model, where a progressive tax funds a basic but decent minimum for everyone, and if they want more they can pursue careers on top of that. This has several advantages: (1) a universally well-sheltered, well-educated population, (2) the freedom to persue entreprenurial ideas without worrying you’ll go bankrupt and become homeless if you fail, (3) better relationships with family and neighbors because you’re not depending on them for necessities the government doesn’t provide, (4) less violence in society because people aren’t desperate and stressed and panicking. One thing Finland does is a Baby Box: a box with baby supplies given to all new mothers, and the box itself serves as a sanitary, safe cradle. And the parents get a year of parental leave or something like that. A few US organizations have started experimenting with baby boxes. Sounds good to me. As soon as there are free homes, income, food, clothing, food, and transportation, I won’t have to work. Hopefully you’ll spend your time being a great philosopher and writing books and giving lectures to impart your enlightenment to others. A kind of guru. Rather than watching mindless TV and playing video games. But if you want to fry your brain on mindless TV, is there any reason not to give you a roof and food to survive and not loiter in the libraries and parks? Transit should not be free because it reduces perceived value. Absolutely. Free stuff is not respected, at least in this country. And, when something isn’t valued it gets trashed. That attitude doesn’t exist in countries like Japan or Sweden because people realize nothing is actually free, and the “all for one, and one for all” mentality is a national motto rather than storybook dialogue. But over 60% of riders ride for free (orca cards paid for by someone else). How come they’re not trashing the buses? Yeah, just like no one values the police, parks, sidewalks, libraries, public schools and most streets. The only roads around here that people actually respect are 520 (over the water) and those special HOT lanes. When the SR-99 tunnel opens, no one will value it until the tolling starts. That’s an unfair framing of the situation. 520 and the HOT lanes are valued more appropriately because they do have a price. The other roads are overused because they are free – they are not valued enough. People use them more wastefully than they otherwise would if they had to pay. The “Tragedy of the Commons” is a real thing. Lots of people will litter in a park or sidewalk but wouldn’t throw trash down in their own yard or kitchen floor. They don’t bear the cost of their own actions in public spaces. I’ll use a transit example – some UW students (who ride for free) take the bus across campus rather than walk. It slows down the buses massively and causes an artificial capacity crunch. Imagine you’re a 372 rider from UW hospital trying to get home to Bothell after your shift, only to find the 372 is crush-loaded with people riding 2 stops and you can’t get on. In spite of what I said about Pine Street above, when I went to the U there were no campus shuttles and the routes through campus were mostly suburban expresses, so everybody walked. I never thought it was a problem and I think the demand for shuttles is kind of ridiculous. The UW campus is a pleasant place to walk, unlike crossing I-5, and there was a disability dial-a-ride for those who couldn’t walk. But the people packing the Metro buses aren’t “riding a couple stops across campus”. While riding from Campus Parkway is questionable, most of them are transferring from other routes. People coming from the northern U-District walk in at 42nd, 43rd, or 45th. And a lot of the crowd is people coming up the steep hill from U-Village. I feel that it is possible that making transit free within this year would not necessarily be a good idea. 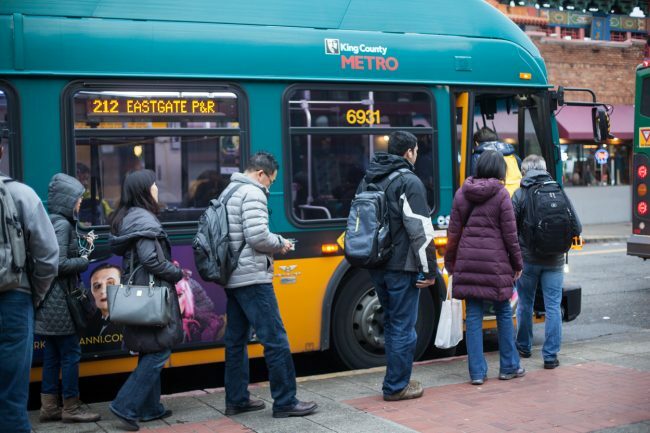 It could drum up support for the Eyman initiative among taxpayers that don’t take transit. Nobody is proposing a free transit initiative this year. It will take a few years to introduce the public to the idea and debate its merits and the best approach. Even then, I don’t see a free transit initiative in King County in the next decade or maybe even ever. The more immediate issue is to discuss: Is this a good ideal? What would the real negatives be (as opposed to hysterical fearmongering)? How could we mitigate the negatives and what level is acceptable? How would we pay for it? How can we avoid displacing other needs like more bus hours and capital improvements? etc. Universal Basic Income is another new idea; which I think is a good idea, but it’s only a few years old and people are still getting used to it, and most people haven’t even heard of it yet. One thing the city/county could do now is consider its ultimate goal. Do we want free transit eventually? If so, the program for free ORCA cards to public-school students should be designed as a step toward this, rather than as an arbitrary one-off. In the last podcast Frank or Martin mentioned that the city would have done better if it had had an overall streetcar plan from the beginning, and built the SLU and First Hill streetcars toward that. But instead, the SLU streetcar was a one-off because Paul Allen wanted a streetcar like Portland, and the First Hill streetcar was a one-off as a half-baked mitigation to First Hill for not building the First Hill Link station. And now the CCC is trying to make lemonade out of lemons. Vast majority of the pavement I drive on is not tolled. Does that make it count as “free”? Nor do I have to clear a turnstile every time I board a sidewalk. I’m glad to pay for one less complication for my personal budget. Does my ORCA pass “side-sleaze” some rule of financial responsibility? Really would appreciate its possession protecting me from a charge of fare evasion over a tap-mistake, but cannot afford the time and court cost to publicly shame Sound Transit out of ever doing that to me or anybody else again. Anybody else notice how often “free” gets used as a political sneer-word? Intent being to suggest that it’s God’s will that anything worth having is worth paying somebody else’s profit to acquire. Is that really what you mean about “perceived value”, Jack? Though you may be onto something. Put “Good To Go” cameras and toll booths on sidewalks and the “Poop Scoop” police can all be re-assigned to duty shhhh-shhhh-shhhh-ing kids at shamefully still-publicly sneakily-financed libraries! I’m more in favor of an incremental approach. There’s a really big middle ground, an important middle ground between $2.75+ and free, for 2-hour system access transit fares to be something like $1 per ride with an ORCA card, or $2 when paid in cash and paper transfer. That would both encourage the use of an ORCA card and make transit in the region far more affordable. For comparison, one way fares in two of the cheapest transit cities in the country are: LA around $1.75, and New Orleans around $1.25-$1.50. That’s where Metro’s high fares come into the debate. In the 80s Metro was 40c one zone, 60c two zones. it got up to $1.25 in the 90s or so. It accelerated after the 2000 recession to avoid cutting service, and again in 2008 because gas was over $4 a gallon, and again after that because of another recession. The county has a policy of keeping the fare within 20-30% of the cost, so when it nears the floor the county raises it. All this is in a backdrop of what kinds of taxes the state allows for transit. Income tax is out, property tax is mostly for more important things, so the remaining one is sales tax. Sales tax is sensitive to the boom-and-bust cycles of the economy so it’s an unstable yo-yo. Most states give direct subsidies for local transit, or even run it themselves (e.g., New Jersey Transit). Washington won’t give local agencies a dime, because the state focuses on state highways and doesn’t think transit is its problem. So the cities have to fund it all with rate-capped sales taxes, and the state has no concern with making sure the rate is enough tor adequate frequency and coverage. So with all that, Metro’s fares are now among the highest in the country. And in other cities with high fares like New York, you get a lot more service for it.. Agreed. I think a good middle ground could be to reduce the fare for Orca Lift, increase the age where children can ride for free with a fare-paying adult, and increase the requirements for employers to purchase transit passes on behalf of their employees. I’d also like to see more residential bulk-pass purchases. Denver has a program where the residents of an apartment building or neighborhood area can get a bulk discount on monthly passes similar to U-Pass and Passport. There’s a myth that most commuters have employer-paid Passport cards, and that may be true numerically but it leaves out a lot of people who don’t work tor the largest employers, or work in outlying areas where most of their coworkers come from the suburbs or outer neighborhoods and drive. Convincing those employers to offer subsidized bus passes that only a few people will use is a hard sell. Sometimes they offer a pre-tax deduction for employee-paid passes, but that’s a lesser discount and runs into the gray area of whether you can use the pass for non-work trips. The formal rules say work-only, but Metro doesn’t have anything between work-only and unlimited, so you’d have to pay the full e-purse fare between that, and that would negate the savings of the pass. Can you explain a bit more what is the purpose of the bulk discount for neighborhood group purchases of transit passes? I am in favor of reducing fares overall to be more in line with other cities, but I don’t see the advantage of a bulk purchase program. Seems like that program would have some overhead costs, and why should my access to the discount depend on whether I can convince my neighbors to buy in? The advantage is that your pass might be $50 instead of $99. The reality of climate change, increasing income inequality, and the challenges of fare enforcement all demand that we at least consider putting an extra thumb on the scale in transit’s favor. Those are all important considerations, but I think you’re missing one too. Increasing people’s mobility is an important end unto itself. You cite concerns about induced demand, but what’s the flip side of that? There is suppressed demand, people who want to be able to take trips but can’t or don’t because of the costs involved. More ridership is a good thing. And, jumping back to politics, it is overwhelmingly likely that free fares would lead to greater political support for transit. People tend to support things that they can benefit from. There is a reason that Social Security and Medicare (which pay benefits to all) remained untouched when so much of the means-tested safety net was slashed. And that Medicaid has jumped in popularity with the expansion to much larger portions of the population. In terms of financing, is that $300M gross or net fare revenue? I don’t know, just asking. But if it’s gross, then the net figure is probably around $225M. And then some large chunk of that is currently paid for by employer-provided passes. Which is to say that at least a good portion of the revenue could be replaced by some tax on businesses that could be a net wash for the employers already providing passes, while not giving a free ride to those who don’t. There’s an optimal level of mobility, where everybody can make the trips they want, subject to the intrinsic limitations of a mass-transit system (you have to go to a stop, wait a few minutes, etc). That level of mobility allows them to be the most productive members of society: they can get to work efficiently, shop for groceries and errands, attend cultural activities, visit their family and friends, take care of their elderly parents, and go to the park (because nature is good for health). Tourists can get around the city, etc. All this is for the benefit of society as well as individuals, so it makes sense for society as a whole to pay for it. So the optimal amount of transit is “unlimited”, so that people self-select the amount that’s right for them. There should be a comprehensive transit network running frequently to all significant destinations and housing concentrations, so that less than 50% of the population chooses to drive or have a car or take carshares. The kind of transit that places like London and New York and Cologne already have. As for roads, beyond the buses’ needs there should be enough road capacity for emergency vehicles, working trucks, people transporting big heavy things like furniture, disabled drivers who can’t walk to the bus stop, and a moderate extra for choice trips. But we can’t build enough road space for everybody to drive everywhere as much as they want. We tried that in the 20th century and discovered it doesn’t scale. So the right amount of transit is “unlimited”, but the right amount of car accommodation is “limited”. I’m with Martin on this one. The goal shouldn’t be to replace fares one-for-one with other funding sources. The goal should be to grow and improve the service. Making transit free for various groups (commuters funded by their employers, Seattle public school students, UW students, etc) comes with additional funding sources, not replacement funding sources. I’m glad to see Mayor Durkan has evolved from seeing a need for cars to be on 3rd Ave to “Don’t drive on 3rd Ave”. But Mayor, police don’t where signs saying “This is a bus-only lane”. Red paint does. We’re throwing away sales tax money every year to pay for the slowdowns to over a hundred bus routes caused by not painting 3rd Ave red. And that camera enforcement bill? I watched the testimony last year. The Republicans will point out that without red paint, transit-lane enforcement is just a ticket trap, not a tool to keep drivers off 3rd to begin with. If you are hoping to fund the ticket cams with fine revenue, that would mean you don’t want the lanes to actually get cleared of private cars. So, if you want the bill to pass, you’re going to have to accede to requests that the camera enforcement only happen on red-painted lanes. So then, the question arises: Without expectation of fine revenue, how are we going to fund the transit-lane camera enforcement program? That’s actually quite simple: See how much Metro saves in 3rd Ave service hours after red paint is applied. That figure should be orders of magnitude larger than the camera enforcement operating costs. But, but, the loading zones, and street parking, and parking lot entrances … Fine, just don’t paint those particular half-blocks red. But paint the rest. Pretty please? At the very least, we should think about what the goals should be, not just regarding the fare but about all aspects of transit. I wouldn’t make fares free. The best things to do for public transit is to increase gas taxes and require Uber cars to be electric which would require higher fares. Gas taxes and fares should be used for better transit options. From what I have read, those places with free transit get more FTA grant money for doing so. Places like Corvallis, OR say it would cost more in grants than they would gain if they started charging a fare. If that is the case, then it would be interesting to know the actual shortfall, as it is less than if fares went away completely. It would be particularly interesting if the grants gained would be more than is lost by eliminating the fare. Small Transit Intensive Cities funding is something that fare free systems tend to qualify for. The grants don’t typically cover all lost fare revenue, but it helps. Google Cache Valley transit fare free for a more thorough description. There’s a chapter in their SRTP that discusses this. At $36 a month- which I never come close to using- my Senior monthly ORCA Pass is indecently cheap. If doubling it would be cover my share of the fares of everybody through at least high school- call it Transit Constituency-Building and just do it. Whatever my month to month transit needs, I’ll benefit by the positive votes. And. Make the plain possession of my pass the Proof of Payment I believe I’ve paid for, and I’ll make it an even $100. Which should pretty well cover the cost of whatever accounting anybody needs to do to see that seven mutually-disagreeable little agencies each get their last Abe Lincoln eyelash outta my pocket. Above paragraphs are what I mean by “Free” Transit for those whom Transit needs as much as they truly deserve to ride it. Make the most of it. It’s already essentially free. Just tell the driver you need a ride. Works great.. Especially if you are a person of color. Every time you ask, you never know if the driver will hassle you or the other passengers will give you dirty looks. That’s not something people should have to endure every time they need to go someplace further than they can walk. And it doesn’t work if your bus route has been replaced by Link. Generally, the people who flagrantly don’t pay a fare or respect to the driver don’t give a rat’s arse about “dirty looks” from other passengers. I don’t think some of the free transit advocates actually use routes where lots of obnoxious people use their middle finger as payment. Until those types are displaced and some sort of aggressive return to civility returns, I will argue for more gatekeeping rather than less. Thank goodness Link shows no signs of disrupting their gatekeeping. What about the other people who can’t afford to pay and are embarrassed to ask? Think of the mother with two kids and a minimum-wage job with spotty hours. It’s all well to say, :”She qualifies for ORCA LIFT”, but when you’re spending 70% of your income on rent and 25% on food and your kid needs medicine and you need to buy schoolbooks, money doesn’t stretch that far. You’re looking at a small subset of the low-income population, the ones who don’t give a f*ck and are belligerant. Mr. Grief, it’s generally understood but politely unmentioned that the dead are invisible. Out of respect, we don’t point this out to them when they board, since they tend to ride quietly and do not even object if someone puts a suitcase on a seat they occupy. Your observation regarding the colors of live people is valid – the ones with the curly red-blonde hair and freckles have a longstanding “rep” for trouble. Being a Scotsman forced by the British to rule Ireland for them instilled some unfortunate lingering aggression. Because a driver’s instructions per “The Book” are to at most request the fare once- if that’s still in The Book. And then welcome the passenger aboard. Which by no means ends the matter. Upon returning to base, the driver fills out an incident report, paid (I think still) a half hour at overtime, giving route, run, time, location, and description of repeat violators. Leaving actual fare enforcement to employees with correct job description and uniforms. To sum it up, the colorless are our easiest passengers to deal with, and are actually comforting to have aboard, just to know our travel days won’t have to end with our Earthly lives. But word to pet owners. A dead ferret will drive another passenger’s live Chihuahua screaming berserk. So out of consideration, please carry the little creature in something warm, quiet, and ectoplasmically impervious. Gray owl feathers are inexpensive, and always work. Thank you. Fares are an important way for riders to express dissatisfaction of transit. Without losing fate revenue, Rosa Parks would have never motivated enough citizens for change. Fares also motivate systems to add buses to some routes and cut others because the fareboxes give daily info on usage. Keeping riders happy and using transit is a basic motivator that free fares would eliminate. Think of every fate as a little approval “vote” each day. There’s free fares as a principle and eventual goal. Then rhere’s free fares as a short run reality when transit agencies rely on fare revenue etc. Aren’t the folks in Tallinn happy with their free fare system, how ever they are funding it? Parks, libraries, and public schools are essentially free to the user. Why not, eventually, transit? In Tallin the city buys passes for all residents. Visitors and suburbanites pay fares. There’s a bit of chicanery with suburbanites making dubious residency claims. I’ve seen a couple articles about its post-rollout performance. The change in ridership and cost is modest, around 5-10%. I think there’s some concern about increased short trips leaving less spaces for citywide trips, and free buses replacing walking. The residents seem to want to keep it, both because it’s a freebie and because it helps low-income people. Free transit, at least in this country, is only workable in some sort of conceptual pie-in-the-sky fever dream. I’m in the trenches (the late night 8) everyday, and from what I can tell, people that aggressively ride free are not good citizens, and often make the bus an uncomfortable option. Plus, there is evidence that as ridership increases, trip length decreases (meaning you’re taking people off their feet and bikes rather than out of their cars, which is probably worse for a society’s physical health). Even in the European utopia of Luxembourg (a super cool tiny country, BTW), where free transit may very well become a reality in the near future, one of the main counterarguments (other than the reduced trip length thing) is that graffiti and anti-social behavior will increase…and so the pro-free side has proposed increased security (which is great, but probably wouldn’t survive the SJW sniff test here). Given that anti-social tendencies are already WAY lower in Europe, I can only imagine how bad it might be here. Provide us with European levels of security and non-compliance penalties, and I’ll think about free transit. Europe is quite liberal, but the bureaucracies aren’t stupid/naive and expect a lot in return from their citizens. We can’t have nice things in the US…at least nice things that are freely available in the proverbial public square. I wish we could, and I used to be idealistic about it, but geez-louise, experiences which have become increasingly frequent have scrubbed that notion from my brain. Until we get serious about teaching (and enforcing) civics, there has to be some form of a gatekeeper. I should explain why the ‘reduced trip length phenomena’ is a concern for Luxembourg’s free transit advocates…basically, they are trying to reduce a high single occupancy commute rate (relative to the rest of Europe) from outlying areas/adjacent countries, and it’s negative externalities (traffic, pollution, the poor having to have cars to get to the suburban/exurban areas), and they’re worried it won’t have the intended effect if (for example) it just puts the “downtown” person who normally walks to the supermarket on the tram instead. Transit use could surge, but not in a way that would actually solve their original problem. Felsen, why even bring the fare question into the discussion? Around public transit in general, you’ll get wide popular agreement that whatever the root causes of violence, transit systems in general will not hire and deploy necessary law enforcement to make ridership endurable. Not out of misplaced sentimentality toward criminals, but because none of the likely victims are well-enough paid, or positioned, to demand the protection transit passengers deserve. When I drove nights in Rainier Valley, my high school age local passengers repeatedly told me they’d personally “had it” with lax and lacking uniformed protection, and were wondering when Metro was going to do something about it. Northern Europe’s presently superior public order stems from a lifelong civic understanding. That Government is by its nature neither a tyrant nor a benefactor, but the people’s own set of tools for keeping their lives livable. Instead of thinly-disguised armed robbery, taxes at heart are beyond membership fees to more like family expenses. Like family, taxpayers pay each other’s transit fares and medical bills to voluntary associations they themselves own and operate. Freeing themselves from the need to pay anybody else’s corporate profits over and above expenses. But also obligating themselves to financially and if necessary physically defend each other from abuse and injury. When you deny somebody a transit boarding because they can’t afford to pay a fare, you’re not increasing the system’s level of civility. You’re just leaving the victimization at the curb-side where you don’t have to watch. Which, to ‘way too many Americans, really is the whole point. Isn’t it? This is the same issue as Uber. Ideally most ridershare trips would fill in the last-mile gaps and crosstown gaps in the transit network, but in fact most trips are within downtown and the adjacent neighborhoods that already have the best transit. It’s a fact of life when wealthy people can buy what they want, and it also reflects where the most trips are. So the Luxembourg opponents are right that reducing suburban car commutes probably requires a different approach. That doesn’t negate the value of a free bus network, but it means you need more than just that to reduce outlying car trips. I doubt people are driving because free riders are packing the inner-city segments (or would be if the free-transit plan were implemented); they’re also driving for other reasons. New York City has massive transit options from all directions but there are still people who drive in to Manhattan; or take transit for the commute but drive in evenings/weekends. And Luxembourg doesn’t have nearly the belligerent homeless tweaker problem the US has. I’ve read it comes from the history of walled cities. Europeans saw cities as their protection from lawless highwaymen and rural nobles. Americans see cities as dens of sin, polluting factories and squalor, and undesirable brown people, the opposite of Jefferson’s yeoman farmers and the ideal of a country house. I have analyzed fare free in multiple different systems and helped implement fare free in a system in the past 5 years. Austin, Texas tried free transit 25-30 years ago. They canceled it after a while. I don’t recall the specifics, but I’m sure you could research it. One thing I do remember is that some routes became havens for the homeless, during both the day and night. Service quality declined massively in the Austin experiment. The perception of rolling homeless shelters didn’t help either.